I just want to thank you from the bottom of my heart for the amazing service you provided me at the very end of my pregnancy. You took me under your wing only days before I gave birth and offered advice and amazing support during my transition from an Obstetrician & planned Private Hospital birth, to a Homebirth with Simply Midwifery at 39 weeks. Your professionalism is outstanding, you are both highly knowledgeable in your profession and the skills required to assist a woman throughout her pregnancy and during her labor. I am grateful that your services continued 6 weeks post partum, as I understand that in a Hospital Setting with an OB or via the Public Hospital system, there is hardly any aftercare once you are out of Hospital. You and Vanessa were on call, assisting me with any issues or concerns, and you continued the weekly care of Jacob until he was 6 weeks old. Once again, Thankyou for everything you do at Simply Midwifery. You give Women a voice, allowing them to birth the way nature intended, without unnecessary medical intervention. Jacob is a pure treasure and I know that it is because of the care, support and reassurance you provided throughout the birthing process and in the aftercare that has helped him become the delightful child he is. I have no hesitation in recommending your services and will be using your services in the future if we decide to have another child. Vanessa Butera is the only person in the world who I would trust to be my midwife. She has delivered three of my babies at home and if I plan to have any more babies in the future I would time the births around Vanessa's availabilities! I always felt safe and very well cared for. I was never rushed or stressed. Vanessa always respected my wishes and opinions. My births were always quick with no tears or complications. My babies were always healthy, and still are very healthy. My last baby was born on Christmas Day, just after midnight. After I had a sleep, I felt well enough to carry on with the festivities and even went out to have Christmas dinner with the relatives before the baby was even a day old! Vanessa really is amazing!! I would encourage all parents who are expecting to invest in her services because you and your baby really deserve the very best care! Vanessa was and is our first and only midwife this will become very clear why by the time you have finished reading this. 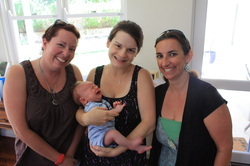 I first met Vanessa threw midwifery program in 2006, we were inquiring about our 1st pregnancy as a home birth and Vanessa was the midwife that we were allocated. Vanessa professionalism, experience and compassion to her mums to be is second to none ( I can say this as we now have 3 children all birthed at home and all very healthy, over the years we have meet a lot of midwifes and a lot of friends have had children and we have heard all there experiences). Vanessa's sole focus on the mum to be and the implementation of the birth plan ( Birth plan included a full preparation of back up hospital beds, ambulance and any other health concerns that may have arisen over the duration of the pregnancy ), by the time it was time to birth the was no stone unturned and MUM was fully prepared for the journey she was about to embark on and so was I the DAD. I had total confidence in Vanessa's skills knowledge and experience to make the right judgements / decisions in any of the circumstances that may arise. Vanessa is a very thorough professional that holds her self with a great deal of confidence. I do not use words lightly around this area of my life, as you would understand that your own children transcend all barriers of love and commitment and all you won't is for your children to be safe and healthy. I would stan in front, behind and alongside Vanessa with out question or doubt in her ability to bring a new born into the world safely and also keep the mother fit and healthy. I am going to end this Testimonial / Reference or what ever you choose to call it with a photo of my FAMILY this will tell you a lot more than I could ever wright down. Please feel free to contact me at anytime anywhere I do and will support Vanessa on her journey as a midwife, it would be the very least I could do for the person who has kept my wife healthy whilst she has had three successful home births. For my midwife, my friend, our family member, our hero. There are millions of words to find to describe how simply amazing this woman is. Without her I wouldn't be who I am today. The meeting was purely by chance, having not long arrived from the UK to live in Australia. I was in a new relationship with my australian partner, when we arrived in WA planning to travel until we discovered I was pregnant. It took a while to sink in and there was a lot of emotion attached to this pregnancy, not only because I was in a new country and in a new relationship but mainly because at the age of 14 I gave birth to twins girls and had them adopted. This meant that I was pretty raw and knew only one thing, that in this pregnancy I needed to be in control, I needed to be treated like a woman, someone with a heart and a mind and not just a mere number as I was all those years back. After that experience , I knew that this one was and needed to be different and the only way I felt that I could be in control was to look at the option of a home birth. I was 5 months along when we visited the Baby Expo in Perth and came across the Community Midwifery booth and instantly fell in love and knew this was our pathway. I receiecd a call to say that we may not be able to be on the programme because where we lived was just outside of the cut off. However, the universe was looking out for us because it turned out there was two of us due at the same time in the area, and therefore we were able to combine appointments. I remember my first meeting with Vanessa so well, she walked in like a breathe of fresh air, not the type of midwife that I had ever had contact with in the past. She deeply cared, she was in no rush. She was there to listen, to hear my story, to encourage me and make me believe that I could have a home birth. She instantly became a friend, someone that I could trust, someone that I could trust so much, that I was able to trust myself, my bodies own innate ability to birth my babies exactly the way women are designed to, so that I could walk out completely empowered. Vanessa has been present at all three births thereafter, just in the background, there in complete confidence that if anything went wrong she would have the knowledge and expertise to know exactly what to do. She would simply watch and know exactly if and when to step in.